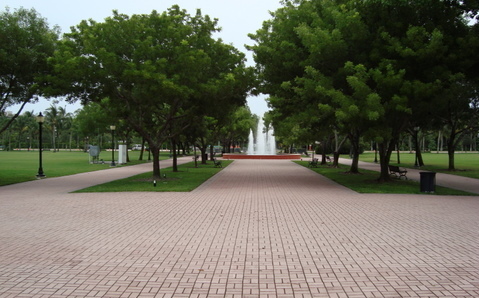 Key Biscayne is reached by the Rickenbacker Causeway that originates in the Brickell Avenue area of Miami. It is well signed from I-95 and US-1. The toll is $1.75 per two axle cars or trucks, but a lot more for big vehicles with three axles or more. The trip from the mainland along the causeway lined with Biscayne Bay beaches is a beautiful transition from the bustle of Miami to the quiet paradise of Key Biscayne. Key Biscayne was an Eden-like island several hundred years ago, a pre-Columbian heaven. It was the center of civilization for the Tequestas, a small tribe of sea-savvy Indians who fished and whaled the crystal waters of the Florida Keys. Because Key Biscayne is only about five feet above sea level, the Tequesta raised their villages on palm pilings, much like the summer homes that today line Florida's coasts. Long before sea turtles were endangered, the Tequesta hunted them for their meat and harvested their eggs for valuable protein. In 1513, Ponce de Leon "discovered" the island and presented it to the King of Spain as Santa Maria. The Tequesta were fortunate in that Ponce only had time to restock provisions before leaving. They weren't so lucky some 50 years later when the ruthless Pedro Menendez de Avila took refuge from a hurricane on the Key. Avila had been on an expedition ordered by the King of Spain in which he was to found St. Augustine and massacre any French protestant "heretics" nearby. Avila established relations with the Tequesta, but unfortunately for them he decided they should be good Catholics. A mission was built, with Jesuit priests and soldiers left behind to ensure the heathen Tequesta became proper Christians. Before long the Tequesta and their new Spanish friends weren't getting along, and well, you can guess how that one ended. During the 16th, 17th and 18th centuries, many a Spanish plate ship met its demise on the treacherous shoals and reefs off Key Biscayne. Much of the treasure from these wrecks remains to be discovered. At some point, the place became known as Vizcaya (Biscayne) when a sailor from that Iberian region was shipwrecked on the island. When Florida was transferred to British control in the mid 1700s, the British tried to bring in colonists and plantations to the vast wilderness. This endeavor was soon aborted after the Revolution sent the red coats back home with their tailcoats between their legs. Spain once again found itself in possession of La Florida. The Spanish crown quickly busied themselves issuing land grants in South Florida, especially Key Biscayne, in an effort to bring Florida into a profitable standing. In 1825, after the US had acquired Florida from Spain, the Cape Florida Lighthouse was built. An iconic landmark still intact today, the lighthouse and its environs became the heart of the newly planned Town of Key Biscayne, with lots selling at $500 in 1839. As Key Biscayne prospered, farmers from the north began arriving and setting up plantations. Most of the island's acreage was used for exotic fruit farms. Due to its isolated subtropical habitat, Biscayne's flora and fauna attracted naturalists like ants to candy. The area's beauty was renowned the world over, and with the adventurers came the tourists. For many years, up until the years just before World War Two, the Matheson family ran a huge coconut plantation on the Key. Key Biscayne, like many Florida locales, became a playground for the "Winter Elite" - a status it still enjoys to this day. While the city saw growth from tourism and land speculators, it took the completion of the Rickenbacker Causeway from Miami to Biscayne in 1947 to really bring major residential development. After World War Two, Key Biscayne was still largely undeveloped. 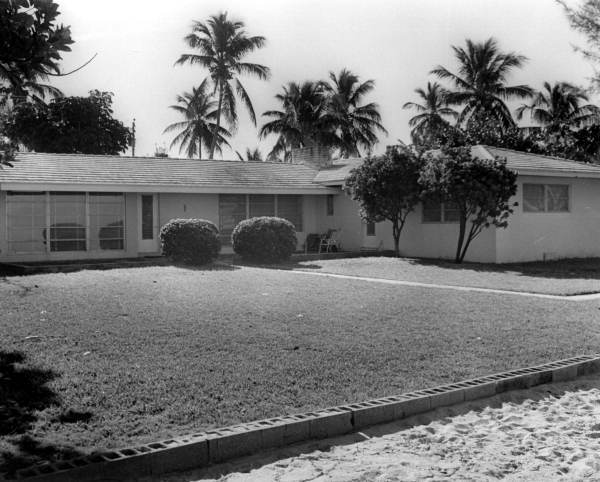 The Mackle Brothers began developing their Villages of Key Biscayne in 1950, and typical houses sold for less than $10,000. These homes were concrete block houses of about 1200 square feet with three bedrooms, one bathroom and a small screened-in porch. These original homes were primarily sold to retirees and young families headed by World War II veterans who purchased them with GI Bill financing with a $ 500 down payment. Many of these same homes, known locally as "Mackles", are worth more than one million dollars today. Affluent people buy them - many from South America - tear them down and build McMansions with room for large families and live-in maids. 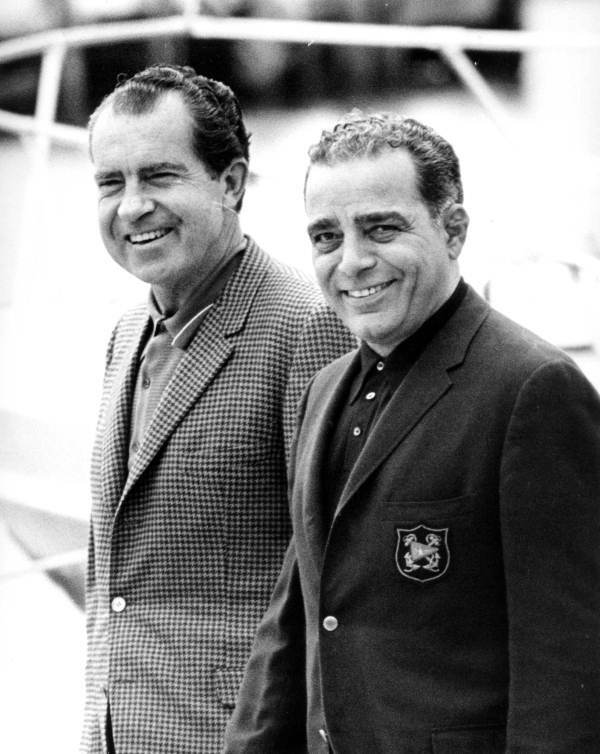 The only bank on the Key in the early days was owned by Charles "Bebe" Rebozo, who later became famous as a friend of Richard Nixon. His Key Biscayne Bank & Trust was founded in 1964. Bebe was of Cuban descent, but regularly attended Key Biscayne Presbyterian Church, sometimes accompanied in later years by Richard Nixon. Bebe instituted a tradition in his bank of always having fresh popcorn in an old fashioned popping machine in the lobby. The wonderful aroma teased your nose the moment you walked in the door. When I lived on the Key in the mid 1990's, the SunTrust bank was in the old location and carried on the Bebe popcorn tradition. In 1969, Key Biscayne Florida saw major presidential development as well when Richard Nixon purchased his winter retreat there, the "Florida White House". He wanted to be close to his old buddy, Bebe. His visits to the Key became celebrity events, and the citizens got used to the Secret Service spending a lot of time before the presidential visits making sure everything was secure. The ranch-style compound, bulldozed in 2004 by new owners, was Nixon's fortress of solitude during his administration and after he was forced to resign due to the Watergate scandal. Key Biscayne FL suffered some damage when Hurricane Andrew hit in 1992, but luckily Bill Baggs State Park took the brunt of the storm's fury. The hurricane turned out to be a blessing in disguise as all the invasive species, such as Australian pines, in the park were wiped out by the heavy winds and rain. The Park Service restored the area with all native plants, and today Bill Baggs Park is a rare glimpse of what old Florida's wilderness might have looked like when the Tequesta thrived here. Perhaps the current economic storm will be the next blessing in disguise for the Key's natural beauty as it might slow down development. 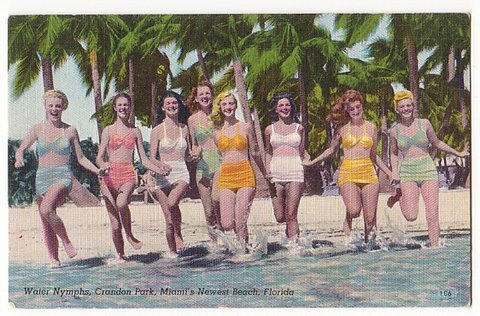 The beaches in Key Biscayne are gorgeous soft white sand, and the best of these is at Crandon Park on the north side of the Key. Sir Pizza. 712 Crandon Blvd, Key Biscayne FL 33149. 305-361-5701. Usual Key Biscayne prices, but very good pizza nevertheless. Very popular with Key natives. 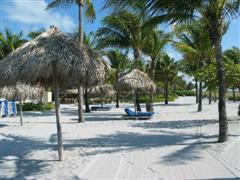 Silver Sands Beach Resort 301 Ocean Dr, Key Biscayne Florida 33149. 305-361-5441. Good Location. 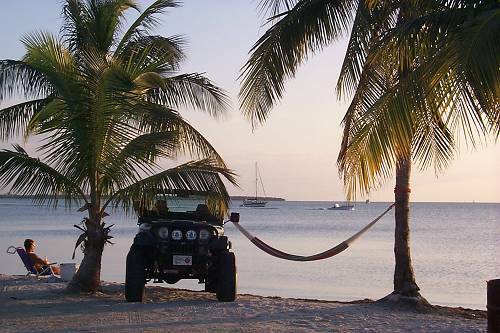 The great beaches of Bill Baggs National Park are a stone's throw away. Lots of European tourists love this hotel, so you'll be amongst interesting company. A bargain for Key Biscayne (expect about $170 a night during the tourist season). Bill Baggs Cape Florida State Park 1200 South Crandon Blvd, Key Biscayne Florida 33149. 305-361-5811. Named after Miami newspaper editor Bill Baggs, this state park is part of an extensive system of barrier islands. Also contains historic Cape Florida Lighthouse which you can ascend for one of the most exhilarating views in Florida, as well as the accompanying lighthouse keeper museum. You may no longer be able to marry a lighthouse keeper, but you can at least see how they worked and lived. Sailboards Miami Water Sports. 1 Rickenbacker Causeway, Key Biscayne Florida 33149. 305-361-SAIL. Windsurfing, kayaking, you can learn how to do it all here. The staff are very helpful and experienced.